My vacation request has been approved. In the last meeting with my manager he made a point to remind me that I needed to be taking some of the vacation days that I have been accruing and to not let them accumulate so high. OK, I can do that. My first request of the year is to take two days off, and to combine with a weekend to go to be with family in Kentucky.Â We are all set to go. Got our tickets on Frontier Airlines. We have used them before and they were pretty good. We prefer them or SouthWest Airlines. They had the cheapest combination for the times we wanted. And, we got our parking reservations at Portland Airpark. Leaving the car with them is much better than at the airports economy lot. We have used them on the busy Thanksgiving holiday, and by taking reservations, we were assured that they would be saving a spot for us. 24 hour personal shuttle will take you right to your car, the lot is personally guarded 24 hours. Safe, reliable, friendly service. They will even give you a newspaper. Now I see that the USA Cycling Master Road National Championships were awarded to Louisville this summer. Hmmmmm. This entry was posted in Portland, Or, Oregon on January 31, 2008 by golinielcomblog. We met Maria Rojo de Steffey early in the morning at Portland’s Terminal 2, while watching the Sauvie Island Bridge arch leave the dock and head downriver. Her involvement with that bridge is winding down, but there’s a lot of work to do before construction starts on the Sellwood. I like that the committee does such a good job of keeping us informed. The Sellwood Bridge project made great progress in 2007. The wide range of possible bridge alignments, cross-sections and interchange types were narrowed down to five complete alternatives that are now being analyzed in the draft Environmental Impact Statement DEIS. Additionally, six bridge types were selected for further analysis in the DEIS. â€œBridge typeâ€ refers to a general structural type â€“ exact designs for any new or rehabilitated bridge will be determined after the environmental study is complete. The bridge types selected are of moderate and higher price that also meet the requirements of different alignments, users, and construction plans. A technical team is now studying the impacts and costs of these alternatives. In late summer 2008, study results will be announced and the public will be invited to help select a locally preferred alternative that includes a single bridge type. Several local governments and the Federal Highway Administration need to approve the preferred alternative. We are confident that by the end of 2008 we will know what type of bridge will be built, where it will be located and how large it will be. Decisions about design details will be made later in the design phase. I would like to acknowledge the tremendous work of the Sellwood Bridge Community Task Force and Policy Advisory Group, whose members spent many, many hours last year discussing the project, reviewing public input, deliberating various options, and arriving at the recommendations that are being studied today. I would also like to thank you for your time and interest in this project as well. We have been impressed that so many thousands of people have taken the time to share their views with us. We will continue to send you email updates as the project moves forward this year. I encourage you to continue to stay involved. For the latest project information, visit www.sellwoodbridge.org. This entry was posted in Spanning the Bridges on January 25, 2008 by golinielcomblog. Many schools in the area are taking time to honor our veterans. Milwaukie’s “Living History Day” is an example of a very successful program that has been giving kids a very real and personal look into the contributions of our veterans. Many schools in Oregon are adopting such programs, bringing in veterans who can share some of their unique experiences. I became of draft age shortly after the Vietnam War had come to a close and not needed for any military service. Since most of my generation were not involved in military service, our views of war were influenced by outside sources. Perhaps the most visual source were the movies we watched. But as we grew older and more experienced we learned that John Wayne’s war was not the wars of our fathers. A clearer way to shape your reality, regardless of your views as to what is right and wrong with any of our wars; is to talk, and to listen, to those men whose lives will forever be changed and shaped by their service to our country. What follows is a talk one such veteran gave to the kids of a far later generation, at the high school from which he had graduated some 64 years prior. “I graduated from high school in June. My class had 50-some kids. My first experience during WW2 was being an airplane observer. This was in the days before we could trace airplanes by radar in the area. The government built little elevated observation shacks every few miles and they were manned twenty-four hours a day, by volunteers. When an airplane was heard or sighted it was the job of the observer to telephone a central command with a description of the plane and as close as possible the altitude, speed, direction and distance of the plane from the observation shack. I also was part of the Civil Air Patrol. One of our duties was to guard any military planes that happened to be at the Eugene airport. The airport had built up dirt berms high enough to hide a plane and we’d walk around it all night, carrying whatever gun we had. I was a hunter and I carried my 12-gauge shotgun. Never did have to use it though! There were about 300 other draftees from the northwestern states going to Camp Roberts at the same time. We were kind of a special unit with a special kind of gun and we were kept together during training and all through the war. Two years later we were discharged together. At Camp Roberts I was trained in the 558th field artillery battalion. The battalion consisted of three gun batteries and headquarters and service batteries. Each battery had about 100 men. I was in the telephone section of headquarters battery. We used telephones and radios for all our communication. The three gun batteries each had four 155m guns mounted on medium tank chassis. The guns were designed to shell concrete fortifications. The shells weighed 98 1bs. and were not attached to a shell casing. The powder was in silk bags of various sizes depending on how far you wanted to shoot and what kind of fuses were used. We had armor piercing fuses and fuses that would explode the shell at different heights above the ground. On June 8, 1944, just a year after I’d graduated high school, we finished our training and were sent by train to Camp Shanks in New York to be shipped out to Europe. Probably the first train trip for a lot of us. It took 5 days. On July 2nd we embarked with our big guns that we had trained with, and about 5,000 other guys, on the US Army Transport Edmund B. Alexander. A live band played as we left. Spent Independence Day at sea and landed in Liverpool England 10 days later. I thought it was interesting that when we came back to New York the next year we only had recorded music. One of my jobs was laying telephone lines between the gun batteries and headquarters battery, and between headquarter and observation posts and other units of the army. After the lines were laid it was our job to keep them usable. Because our lines were mostly laid right on the ground they were broken a lot by shellfire or by vehicles. For some reason, most of the breaks would occur in the middle of the night and that was not fun. We would get a call from the switchboard operator. Then two of us would go to the switchboard and find the bad line. Because we could not use any lights, we would take hold of the line and follow it out till we came to the break. Then the work starts because there were often 8 or 9 lines. We then had to find the other end of our line, attach a telephone to it and hear if it was the correct line. Our battalion was part of General Patton’s 3rd army and we fought through France just below Paris. We were actually east of Paris when it was liberated. Our guns were credited with knocking out several German fortifications, and capturing the soldiers in them. One that I remember was Fort Julian. This fort was fired on from distance 25 yards, knocking down the large steel door in to the fort. They were called direct lay guns because the gunners could actually see what they were shooting at. If there were no forts or pillboxes in our area the guns could also be used as regular artillery. They could shoot up to 7 miles. When the target could not be seen from a hill we also had 2 small observation planes in our battalion. We had some scary times but we also had fun, Such as the time one of the boys got in a small airplane the Germans had abandoned and thought it would be fun to taxi it around. He had never had any flight training but soon he was flying it around and taking up passengers. I declined. Another day we came upon a trainload of small tanks the German army had abandoned. As I remember these tanks were about 8 feet long and 3 or 4 feet wide. There was space for an explosive charge in the front of it and a platform on the back of it for a roll of wire and were powered by a small gas engine. They were to be used to run into our tanks and blow them up. They’d be controlled by wire from a distance. I think they had just come from the factory, as there were no explosives on them yet but had the roll of wire. Some of the guys took the wire drums off so they could sit on the tank and had lots of fun running them around for a while. Another time, we pulled into a small French town and we were the first American troops in the town. All the villagers came out on the street and I think each one had a bottle of champagne they were saving for the liberation. We all got out our canteen cups and got a little taste of it. The thing I remember most about the winter of ’44-’45 was how very cold it was. By Christmas we were nearing the Saar River when the Germans broke through in the Ardennes forest in what became known as the battle of the bulge or the Ardennes Offensive. We then were ordered to turn north and to support the Third Cavalry Group to drive the Germans back. The official Army booklet I have, mentions in one paragraph that in the 2-week period the 558th “… destroyed a total of 35 pillboxes, 2 bunkers, 3 antitank positions and 2 brick defensive positions.” The big mounted guns we had could go thru 7 foot concrete walls and one is listed as cast steel 12 to 16 inches thick. I remember the night sky being lit up many times with the light from so many big guns being fired. We kept the guns going all night, partly as a harassment maneuver. It was not a good Christmas. From the 18th of February into the beginning of March was some of the heaviest artillery barrages in the war as we cleaned the area of Trier in Germany. By the second week of March the fighting was over as far as the 558th was concerned because there weren’t any more bunkers to be destroyed. Most of the men were put to work dealing with getting POWs home to France or Luxemburg or Russia. I could type so I was assigned to making up lists of 25 French POWs for an airplane load to be flown back to France. We used an airfield at a bombed out aircraft factory in Regensburg Germany. This was my job for a few weeks. But after the war was over in Europe the war with Japan was still being fought in the south Pacific and our men and our guns were needed to help them there. I have forgotten, but I think there were only 3 or 4 battalions in the whole US Army with these kinds of guns. We got on a troop transport ship in Marseilles France August 14th, heading for the Philippines via the Panama Canal. When we were 3 days out the Captain announced over the loudspeaker that the war with Japan was over and the destination of the ship was now changed to New York City. We were sent to Camp Kilmer, New Jersey. I will never forget the first meal we had at Kilmer complete with a whole quart of milk and a pint of ice cream. We had not had any milk products or fresh veggies since we left England. What a meal. This entry was posted in Social on January 23, 2008 by golinielcomblog. Every time I take a ticket to get a number and wait to be called, I think back to that moment in the movie Beetlejuice, when he gets the number 54,000,601, and they are calling something like 27.Â My last ticket was to wait in line at the DMV.Â I knew going in that this could be a bad call since it was my lunch hour, but I was on a mission. I had to get new Share the Road license plates for the cars. I wrote about it in my post:Â Oregon Share the Road License Plates out Jan 2nd!Â Â Our plates are not set to expire yet, so yea, it does cost a little more that way,Â but we are anxious to show our support for bikes during the times that we are using our cars. Approximately $8.25 of each plate will be going to the Cycle Oregon Fund and the Bicycle Transportation Alliance (BTA). Fortunately, the wait did not take my entire lunch hour, and I was able to complete the forms to the clerks satisfaction. Three or four weeks, or something like that, is what she promises. So now, the wait begins. This entry was posted in Bicycling & Fitness on January 20, 2008 by golinielcomblog. Earlier, I posted about the prices I have seen in heating oil for our house. For that, see: Our Heating Oil Prices Are Volatile. Now, mom digs out old log books that my grandfather kept. This entry was posted in Our Environment on January 14, 2008 by golinielcomblog. This weeks snowshoe adventure started at the Barlow Pass snow park, on highway 35. From there we headed out the Pacific Crest trail, a popular trail any time of the year. 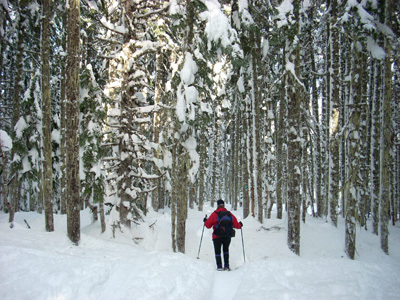 Now, the trekking snowshoer’s are sharing the trail with cross country skiers. This specific area is a little more popular which means a few more people, and the snow isn’t always as fresh as we would like, but it is still quiet and pretty. For a small portion of the trail, it was wide enough to include separate hiking/skiing paths. We try to stay out of the ski treks where we can, but much of this portion was not wide enough to do that. It hasn’t snowed much the last 2 days, as a result the surface was a little icy and crunchy. This requires a little more caution when traversing narrow areas of the trail with steep downhill slopes, or around the tree wells. We take care to steer clear of the tree wells, as we do not want to fall in them now that the snow is getting much deeper. We both carry ropes for such an occasion. 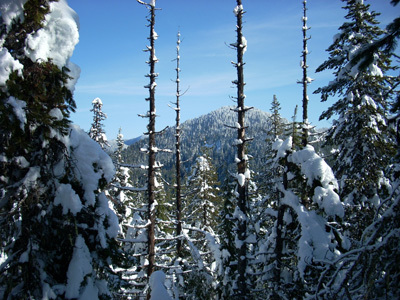 The sun came out on this clear day, which warmed the snow high in the trees, causing a sporadic bombardment of snow upon us as we hiked under the trees. Really more of a nuisance than a danger, but, snow down the back is never a lot of fun. Anyway, after hiking out the Pacific Crest Trail, we veered off in a northerly direction, out onto Ghost Ridge. There really isnt a trail out there, as it is just mostly overgrown during the summer. It isn’t marked but Honey had been out there before, so off we were into the unmarked snow country. It is not as wild an idea as it first sounds since we were on a ridge, and as long as we stayed up on top without dropping down the rather steep slopes too far we could reverse direction at anytime. So we went in search of a nice view point of Mt. Hood for a lunch stop, prior to heading back. This entry was posted in Bicycling & Fitness on January 13, 2008 by golinielcomblog. We go to the party every year, and ride the route most years. So on the 31st, we will have a good idea what we will be doing September 6-13. This entry was posted in Bicycling & Fitness on January 4, 2008 by golinielcomblog. With the rash of car/bike collisions in Portland this past year bicyclists have made a loud and unified call for action. The city of Portland seems to be listening. And responding. It looks like we will be getting 14 bike boxes at intersections this spring. This essentially gives riders a safe refuge while stopped at intersections, making them a little more visible, and safe when traffic starts up again. One of the biggest dangers i face while riding in traffic is when traffic is starting up from a red light. As a rider it is critical that you know which cars are turning (not just the ones who have bothered to turn on their blinker), and which ones are going straight. You must then find a save haven somwhere along side them, where you can start up and continue through the intersection without one of those drivers turning right, and crossing over the path that is currently occupied by me and my bike. A 2-foot-deep stripe at the back of the box will show cars where to stop. Pavement in the boxes and bike lanes leading up to the intersection will be colored green or blue to mark the areas where bikes and cars might conflict. I know that these boxes will cause frustrations for drivers, since cars will not be allowed to turn right during the red lights at those intersections. Antd that they are supposed to stop further back in from the intersection. And I know that many of them just won’t do it. It’s unfortunate that we have to raise driver frustration in order to increase rider safety, especially since it is that very frustration that creates much of the danger for cyclists. But these 14 intersections are mostly busy, central-city intersections with many bikers and pedestrians, so it may work out fine. Plus, if drivers knw the laws, this would not be so frustrating, since letting bicyclists leave intersections ahead of cars is not a new law. We are anxious to see how they affect traffic and the bike culture in Portland. Our Heating Oil Prices Are Volatile. What were the costs per gallon that we have paid to keep our house warm each winter. So, a spreadsheet seemed in order. Here is what I found. What does all this mean? Well lots of things. We do see that prices do rise and fall. It isn’t always about costs always going higher. I won’t attempt to cover the reasons for variations in oil prices. But I have found that buying oil early in the year will usually result in lower costs per gallon. And I have seen, in more than one occasion, that buying oil at the onset of any Mid-East conflicts, (Dessert Storm, 911, Iraq, on and on) is never a good thing. Mostly that the prices have raised significantly in just the last few years. The 16 years from 1988 to 2004 I have seen my costs rise about a dollar/gallon. The last three years, it also rose about a dollar/gallon, and even more, since the last price I paid was early in the season. Perhaps a conversion to natural gas would be a wise economical and ecological choice. This entry was posted in Our Environment on January 3, 2008 by golinielcomblog. On SW Salmon between 1st and 2nd, in Portland, we spotted this free charging station for electric vehicles. 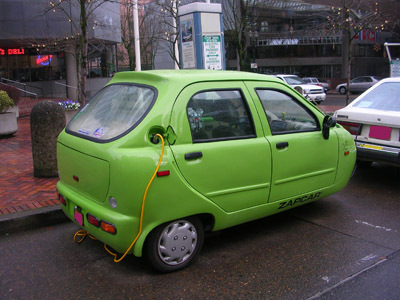 The cord for the electric zapcar simply plugs into what we think of as the gas cap. There was a second car that may have been a conversion from gas to electric, it apparently had its batteries in the trunk. Apparently electric vehicle can pull up to the curb, plug in, and charge up. This filling station is courtesy of Portland General Electric. It is also illegal to park a gas powered car in the station spots at any time. This entry was posted in Portland, Or, Oregon on January 1, 2008 by golinielcomblog.